This review is fort he Marpac Dohm sound machine, a simple but effective machine that general gets very positive reviews. This is a very good noise machine, providing some of the best sound options available on the market. 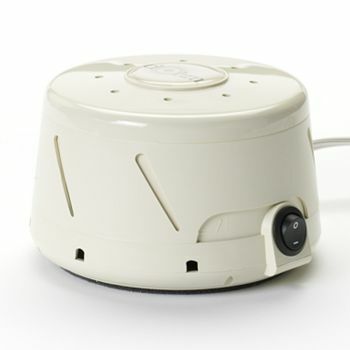 It creates noise with rushing air, rather than digitally, which provides a very natural and uninterrupted white noise for sleep. The machine does not have many additional features, and some users to not particularly like the design. The Marpac Dohm is as easy to use as they come – one of the most intuitive machines on the market. It doesn’t offer many additional features, so it’s generally very easy to navigate. The machine is rather expensive considering it’s outdated design and lack of any additional features, however consumers are still willing to pay for it’s unique noise rushing white noise sound. The sound is very high quality, with the wind rushing being unique to this machine when compared to competitors. This is often preferred to the digital sounds commonly offered. However this wind rushing is the only sound offered, making the selection non-existent. Also due to the nature of the technology, there are only two speeds of wind, which equates to volume. This leaves many users complaining that it is either too loud or too soft with no way to adjust to a middle ground. The Marpac Dohm does not offer any additional features such as a clock, radio, timer, etc. The machine is also not battery operated, which may cause difficulty for some travel situations. The company that makes this noise machine have been around since 1962, and it seems like the design hasn’t changed much since then. Definitely not one of the sleek offerings we’ve seen from other machines. There is no display, with no external lights, thus providing no opportunity to disrupt sleep with light.